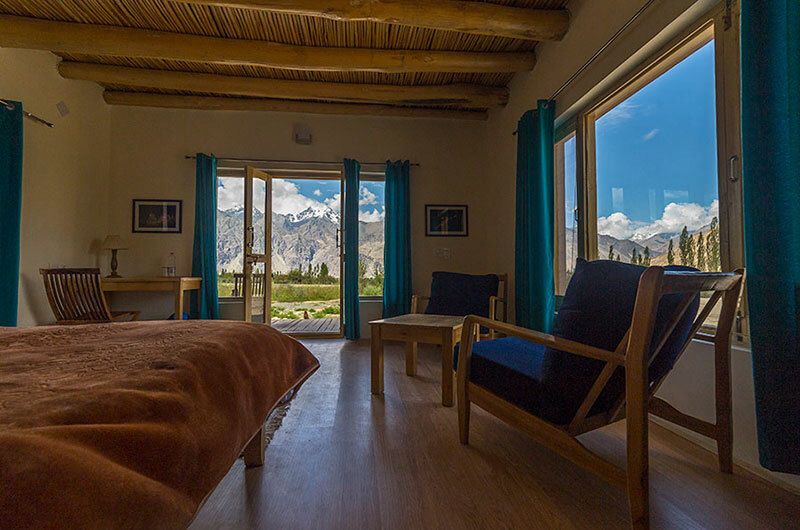 Five Cottages with decks and Four Safari Tents with decks and en suite bathrooms all facing the snow capped mountains and nubra river valley. The Main house has Four GuestRooms with ensuite bathrooms on two floors. All the rooms can accommodate one extra bed. The meals are served in the traditional dining or on the open deck in good weather. 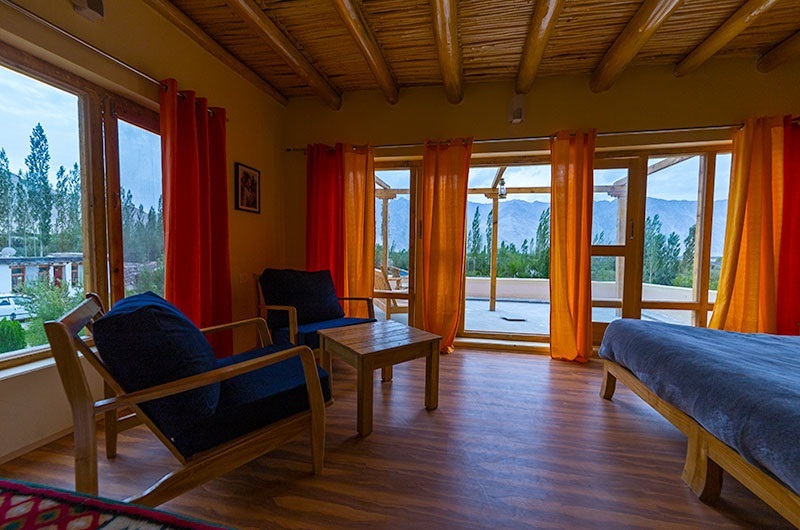 The five cottages are located to get the best experience of the nubra valley landscape, surrounded by a view of the snow capped himalayas, the sand dunes and the river flowing at a distance. The cottages have large windows and a deck with its canvas tent roof. The cottage room has a king sized bed or option to have twin beds and also can accommodate a extra bed on request at a cost. 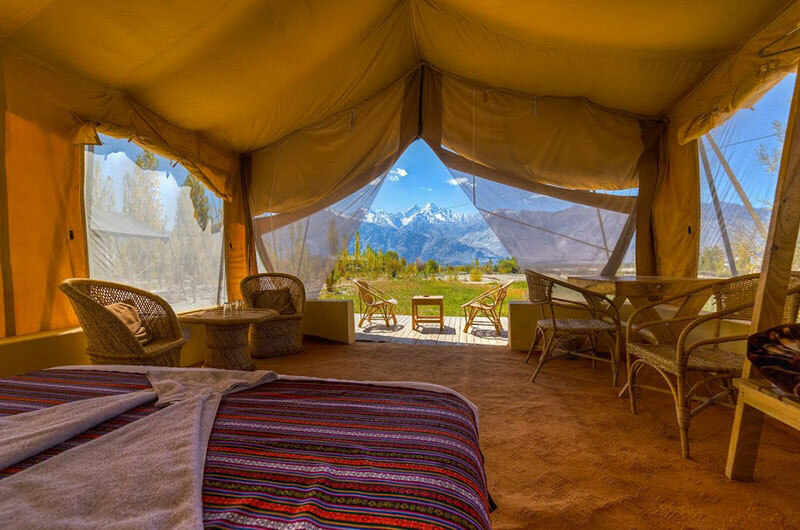 The four Safari Tents are located with the best views of the mountains and valley. The tents are on a raised platform with a large room and permanent toilets and dress attached. They also have a large deck with a view. It has a king sized bed with option for twin beds and also can accommodate an extra bed on request at a cost. The Main house has a GuestRoom with ensuite bathroom on the ground floor and four GuestRooms on the first floor with a large terrace. The rooms have king sized beds or option for twin beds and also can accommodate one extra bed at a cost. With the other common spaces in the house this is ideal for large groups also. GoodEarth Ecotourism is a social venture supporting local entrepreneurs in the remote Himalayas & Western Ghats.